The Salmon Ruins is one of the most amazing archaeological sites of the southwest under the guidance. There is a dedicated team of professional archaeologists and active preservationists that offer tours there to educate, edify and wow visitors to the area. These same archaeologists maintain and oversee many Pueblitos, such as the Salmon Ruins or Dinétah. While we can’t take you there ourselves Indy Fans, we can bring you two phenomenal archaeologists that participate in the program who conduct ongoing research and preservation in this collection of sites. Tune in and find out about a great site of Southwest American History! Geoffrey Haymes is has been an archaeologist with the Bureau of Land Management (BLM) since 2008. As part of the Cultural Resources team in Farmington, New Mexico, under the guidance of lead archaeologist Jim Copeland, he works to ensure compliance with various cultural protection authorities (e.g., NHPA, ARPA, AIRFA, NAGPRA) in an area with substantial oil and gas development and to identify and manage archaeological resources on public lands. With prior work in northeastern Utah and northwestern Colorado, his professional experience has centered on cultures occupying the northern periphery of a more robust and better-understood Puebloan sphere of influence. From 1993 to present, Larry L. Baker has served as the Executive Director of the San Juan County Archaeological Research Center and Library at Salmon Ruins. As a Southwestern archaeologist with over 37 years of professional experience, Mr. Baker has been involved in numerous archaeological endeavors including: research, cultural resource management, and ruins stabilization/historic preservation. Research interests focus on prehistoric and historic architecture, archaeoastronomy, and the Ancestral Puebloan periods of northwestern New Mexico, having been involved in the Salmon Ruins and Rio Puerco Valley projects during the 1970’s, under the direction of Cynthia Irwin-Williams. His work in cultural resource management has allowed him to meet the needs of the oil, gas, mining, and public works projects. He serves as the Principal Investigator of the Center’s archaeological consulting firm, Division of Conservation Archaeology, which has undertaken 3,357 individual projects from 1993 to 2010. Within this framework, he offers his skills in ruins stabilization and historic preservation to various agencies. 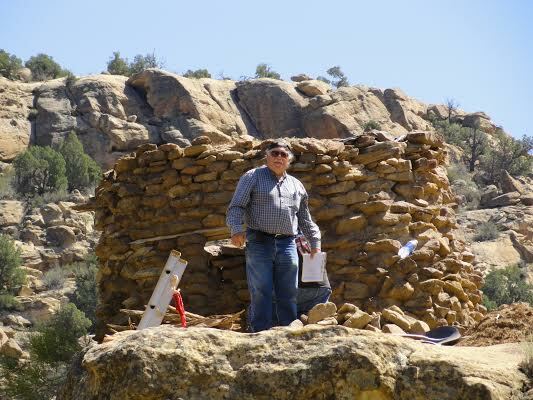 He has organized a team of Native American specialists, who have been preserving prehistoric and historic structures in the Four Corners Region, including not only Salmon Ruins, but numerous Ancestral Puebloan sites under multiple jurisdictions, National Register pueblitos on New Mexico State Trust Lands, and historic homesteads managed by the Bureau of Land Management. December 9, 2015 in Archaeology.